One of the ‘40’s greatest beauties, Vivian Austin was a talented actress-singer-dancer who won many contests, including Miss Hollywood, before landing a stock contract at WB in the ‘30s. Under her maiden name, Vivian Coe, she appeared as a dancer, dress extra, stunt double (for Rosemary Lane in “Hollywood Hotel”), and bit player (“Goldwyn Follies”, “Yankee Doodle Dandy”). 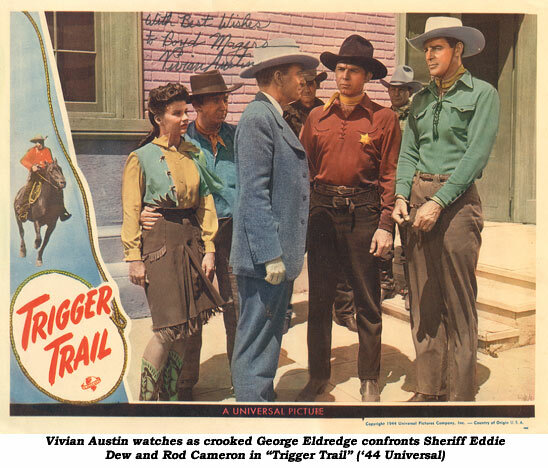 Vivian did five films at Eagle Lion as Terry Austin including two Philo Vance mysteries. Vivian Austin died at 84 on August 1, 2004. 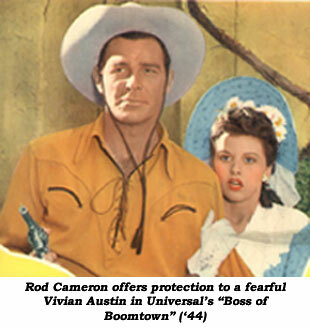 Movies: Boss of Boomtown (‘44 Universal)—Rod Cameron; Trigger Trail (‘44 Universal)—Rod Cameron; Twilight on the Prairie (‘44 Universal)—Johnny Downs; Serials: Adventures of Red Ryder (‘40 Republic)—Don Barry.